I was recently interviewed by Allison Carter from Allison Carter Celebrates (allisoncartercelebrates.com, Seattle). She asked me what easy things can be done to get small children to stay engaged at the dinner table and start learning some basic communication skills. We have all witnessed - or lived through - the meal that results in escapees from the table, or whining to leave, and, finally, cold food eaten. Although it seems like a challenge at the initial thought, I believe there are a lot of steps that can be taken to help achieve a calm and engaging meal experience with little ones and with children of all ages. Make eye contact and include them…even in lighting the Advent wreath. 2. Turn off the television. Don’t allow any devices to come to the dinner table. Turn off all notifications so you are not tempted to look at them. This will set the expectation that face-to-face interaction is more important than a screen. 3. Don’t let anyone be seated until everyone sits together. This is a very important step if you have young children and you want them to remain at the table with your family. Remember their attention spans are short. Don’t let them use some of the energy in their “tank” before anyone else is at the table or you’ll lose them more quickly. 5. Make a point to not have side conversations. Don’t make it a time for mom and dad to catch up where the children feel like they are not included. They will immediately feel bored. Don’t have conversations with only one child without including the others. Evaluate if the conversation at your table typically seems to gravitate one direction to one or two people. Consider if anyone may feel left out. 6. Leave the negativity off the table. Don’t make the communication about chores that have to be done or discipline that needs to happen. Your meal table should be synonymous with feeling loved and accepted and being a safe place to open up. If it comes with negativity too often, your family members will not want to gather there; Or they won’t willingly approach with positive attitudes. Leave those conversations for later when a meal is not involved. 8. Try to say something positive about each person at the table throughout the meal. Share something you noticed them doing that day. Share a compliment. Reinforce good manners they portray at the table. If they feel loved and proud, that will naturally lead to their desire to want to hang out at the table more often. 9. Even the youngest children can feel engaged at the table if you make eye contact and include them in the conversations. Make them feel important. If they don’t know how to have a conversation, just adjust to let them feel like they are participating. Good habits at the dinner table teach consistency and set the expectation of what family meals should look like. You have the opportunity to make that table a gathering place for stories shared, lessons learned, and memories made. If you begin modeling positive communication and conversation skills at a young age, it will quickly become routine and a refreshing part of everyone’s day that could otherwise be chaotic. Enjoy your meal together with deeper connections and it will surely lead to growth within your family. Togather mealtime games were created to solve this exact problem - to ensure a way to stay engaged and connected at the table. 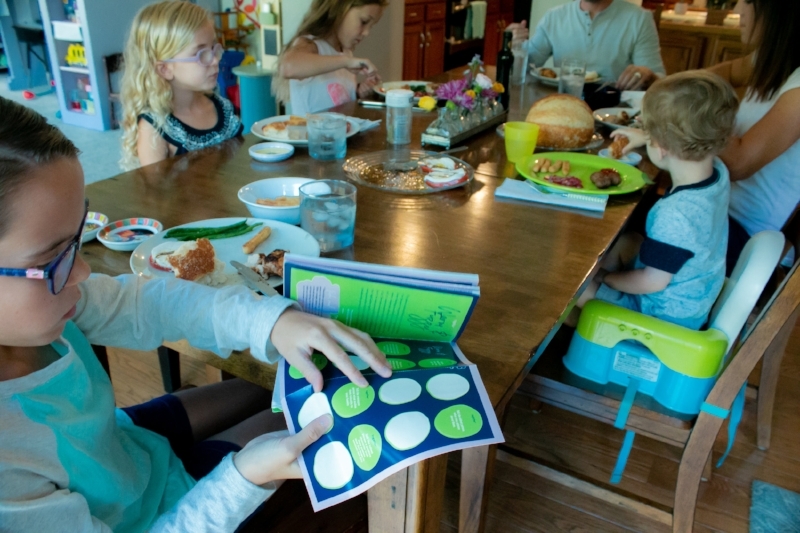 They help bring consistency to your home and mealtime and teach communication skills that will be long remembered away from the table. Visit togathermoments.com for games/tools to create conversation around your table.